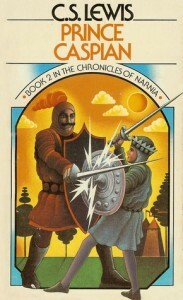 I love the Narnia series and I’ve read it many, many times. Whenever I read this series, I always read it in original publication order – as it should be. It’s hard to review books you love so this is more like…a smattering of a review combined with my general thoughts and feelings. Prince Caspian introduces one of my favorite characters: the talking mouse Reepicheep. Reepicheep is fierce and I love him to pieces. When I first read this series, I was taken with Reepicheep and with every re-read I realize what a wonderful character he is! The bravery, loyalty and honor along with the slight arrogance make Reepicheep a very human character. In this particular re-read, I noticed that both The Lion, the Witch and the Wardrobe and Prince Caspian rather casually mention boarding schools. That is such a different world to me. I have to wonder, what was the prevalence of children going to boarding school at the time this series was written? I don’t think I know anyone who’s attended boarding school. I wonder what the Pevensies’ father would think of the way we live in 2014? The smart phones, the tablets and the constant email…we’re all living at the mercy of our digital devices now. While the Pevensies and Trumpkin are traveling to meet with Prince Caspian, Aslan appears to Lucy and [without speaking] motions for her to follow him. I never really understood why Aslan didn’t appear to all of the children and just Lucy, during this re-read I came to wonder if Lewis was trying to make some point about faith. One definition of (religious based) faith is “belief that is not based on proof.” Lucy is forced to wake everyone from a sound sleep and have them follow her. She is following Aslan but the rest of them can’t see him at all. They just have to trust that Lucy is correct and that things will be alright. As everyone knows, Edmund had been a traitor in The Lion, the Witch and the Wardrobe, so I really appreciate the way Edmund backs Lucy when she tells them that she saw Aslan. This book will also be the last time that the High King Peter and Queen Susan will be in Narnia. They are getting too old and will have to come to know Aslan in their own land. In previous reads, the aging out of Peter and Susan always made me feel incredibly sad…but in this re-read…I noticed that Peter and Susan aren’t as fleshed out as Edmund and Lucy. In the group read for The Lion, the Witch, and the Wardrobe we (the group) focused in on the character Edmund and his motivations as well on the importance of Susan and Lucy (the fact that Susan and Lucy were graced to see Aslan’s resurrection). During this discussion we started to feel that maybe Susan and Lucy were the “important” characters… Now I’m starting to feel that Lucy and Edmund are the important characters in The Lion, the Witch, and the Wardrobe, Prince Caspian and my upcoming read: The Voyage of the Dawn Treader.